PHILLIPSBURG — The Sint Maarten Nature Foundation has uncovered numerous shark-related products, including shark fin soup, being sold at various establishments around Sint Maarten. Over the past few weeks, the foundation made an inventory of shark products being sold at restaurants, supermarkets and individual stores at various locations. “Unfortunately, we have found different products containing shark being sold on our island, including shark fin soup, shark steaks, shark liver oil, shark cartilage pills, ray wings and shark oil. 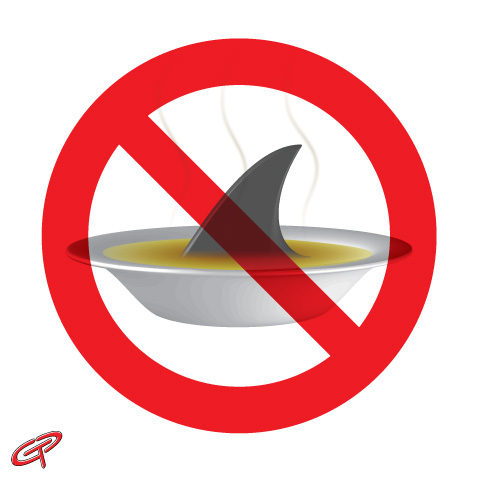 There is no accepted scientific evidence showing any positive health benefits of shark fin soup or shark products, like liver oil and cartilage pills,” the Nature Foundation said in a press statement. “We have been partnering with the prestigious Smithsonian Institute in Washington D.C. and the Pew Charitable Trust to find out whether or not the products are made from local St. Maarten sharks. This is very important because since October 12, 2011, it is prohibited to wound, catch, land, or kill sharks, rays and skates in the territorial waters of St Maarten. So if genetic results come back positive for sharks caught in local waters, laws were broken,” the Nature Foundation stated. Sharks are not frightening or dangerous but an important contributor to the ecosystem and important to the local community as they attract valuable dive tourism. Sharks also keep the reefs clean of unhealthy fish, keeping the ecosystem in balance. The Nature Foundation advises the public not to purchase any shark product and requests stores and restaurants to stop selling any shark product. The foundation will be issuing official letters to stores and restaurants in this regard. As part of the Save our Sharks project there is also an online petition running, encouraging local decision-makers to increase conservation measures for local sharks and to ban the selling of shark products.